This official Mission Complete Medallion is 1.75" and commemorates the historic completion of the Space Shuttle Program. In addition, this limited edition medallion commemorates the exceptional accomplishments and missions of the first winged-spacecrafts. 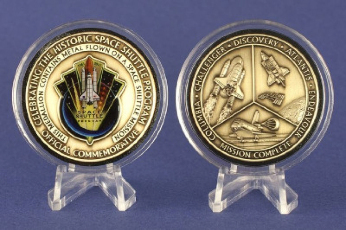 Minted with the same Shuttle flown ingots included in the NASA Award Medallions, this medallion is the second in the series and is also worthy of the program it represents. Since a sample was not completed at the time this Notification was prepared, we have included the actual artwork being used to create this medallion. Per this art, the official Space Shuttle Program Commemorative Design will be embedded in full color on one side, while the other side will dimensionally render a Space Shuttle at work through a launch, space mission and landing. These medallions will be plated in Antique Bronze and protected within circular presentation cases (with high-density, black foam spacers).